Melbourne City Council has approved a controversial policy that aims to increase car share numbers from 250 to 2000 by 2021 while also reclaiming lost parking revenue and pushing car share off-street into private car parks. The Fifth Estate first flagged the proposed changes when the Future Melbourne Committee recommended council adopt a “partial cost recovery” model that would charge car share companies up to $2000 for spaces previously provided free of charge, and also required two off-street car spaces to be acquired from private operators for every one provided by the City of Melbourne. Car share operators said the unprecedented off-street requirements, along with charging for spaces in areas that had no parking meters, would contract rather than expand the industry. See our article Is Melbourne about to kill car share? 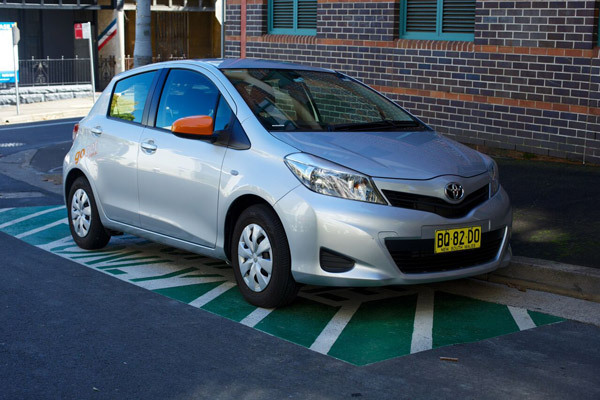 On Tuesday night, Melbourne City Council approved an amended policy that now requires car share operators to find one off-street car park for every on-street park provided. The new policy also reduces fees for non-CBD areas to be more in line with a residential parking permit plus a once-off administration fee, similar to a City of Sydney model. The council still intends to hit its 2000 target, with the one off-street for one on-street adjustment meaning Melbourne will need to find 1000 on-street car share spaces, which councillor Rohan Leppart said would be “an absolute stretch”. Chair of the transport committee, councillor Cathy Oke, who put forward the amended policy, said a 12-month review had been added, with a report that would evaluate the off-street parking requirement – a policy position that has not been undertaken by any other council, and one she admitted was a “work in progress”. Car share operator GoGet’s chief executive Tristan Sender told The Fifth Estate there had been progress. GoGet was also pleased to see a reduction in off-street parking required. “While there are still significant challenges with this, as it takes a substantial amount of time and money to build off-street capacity, City of Melbourne has committed to working with us on this, and we are really looking forward to cooperating closely with Council,” Mr Sender said. The amended plan also brings forward a plan to make car share a theme of the City’s developer forums in order “to bring the car share companies, developers, car park operators [and] body corporates together in a meeting to try to accelerate the off-street car parking”. Councillor Stephen Mayne was the only person to vote against the plan, even providing his own amendments to the policy, which lapsed following Councillor Oke’s amended plan being approved. Mr Mayne wanted to see no more than 60 per cent of on-street parks controlled by a single operator. Under the current policy, a car share operator able to procure multiple off-street parks could then be handed the lion’s share of on-street parking. The off-street parking requirement, he said, was problematic. GoGet in its submission said a two-for one proposal would add $1 million to costs, and that the new one-for-one requirement would thus add $500,000. “The instant effect of one-for-one will stifle the scheme, because before they can get any more spots they have to stop, run around, and find hundreds of off-street spaces that they currently haven’t got,” Mr Mayne said. Mr Mayne said the council was already millions ahead of budget in terms of parking revenue and the council didn’t need to be “dying in a ditch over a few hundred thousand dollars here or there”. He also wanted council to be provided figures on the 270 spots currently given to the taxi industry for no charge. The debate on car share has been marred by conflict between councillors, car share operators and the community. It has been one of the council’s most contentious debates of recent times, with 155 pieces of correspondence received from the community. In Tuesday night’s meeting Councillor Richard Foster, deputy chair of the transport portfolio, had a dig at car share operators, who he said wanted the council to “prop up” their business but were also attacking the council’s green credentials. He said it was “entirely outrageous to suggest that Melbourne, one of the most forward-thinking, progressive, environmentally sustainable cities on the planet isn’t green enough because we won’t make ratepayers spend their hard-earned on commercial enterprises”. “If people were serious about running green car share businesses, maybe they’d be running electric cars and installing car charging points across the city,” Mr Foster said. He said there were plenty of commercial businesses that had positive social impact that didn’t get a cent from the council. Councillor Jackie Watts lamented that car share operators had allowed the framing of the debate to move down into solely an economic argument about viability. Car share operators had not portrayed themselves to council in the most favourable light, she said. “What we’re talking about here is a public good – a sustainable, collaborative, useful piece of public transport in the city,” Ms Watts said. This, she said, was “very difficult to cost”. At the end of the night, Ms Oke said a united front needed to be forged to progress car share. The new policy is to commence from September 2015. Absolutely there should be some form of charge but it needs to be in line with the market for private transport. Plainly, car share yields (to some extent) public benefits but they are still commercial enterprises and will adjust their business model to suit the charging regime. In CBDs, kerbside parking is a scarce public good and it should not be available to commercial interests for free. There’s also an argument to be made for levied taxi ranks. In my view, the off-street 1-1 requirement is reasonable but only as a requirement against additional allocated supply: not as a retrospective device. It sounds like MCC got this right. In San Fran CBD, a bulk of car share spaces are off-street. Clearly, the model can work fine.